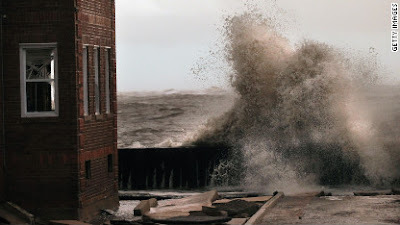 The destruction caused by Superstorm Sandy mounted Tuesday morning as electrical fires and record power outages added to the misery of devastating flooding in the Northeast. More than 7.5 million customers shivered without electricity in 15 states and the District of Columbia in Sandy's chilly wake. Sandy also claimed at least 26 lives across the United States, bringing the total number of deaths to at least 94 after the storm wreaked havoc in the Caribbean. The storm sent trees crashing down and left neighborhood streets looking like rivers. Homes washed off their foundations and onto a New Jersey state highway. Floodwaters rushed into New York's subway tunnels. Hundreds of people were stranded in one New Jersey town alone Tuesday morning. And Connecticut's governor offered ominous advice in a Twitter post: "If u find urself surrounded by water, call 4 help if u can, then get 2 highest level of home. Hang a white sheet out a street-side window." Meanwhile, the stench of smoke blew across flooded streets as fierce winds and rising waters shorted out power lines and sparked fires in places such as Lindenhurst, New York. At least 80 homes burned to the ground in the Breezy Point neighborhood of Queens, fire officials said. The cause of the blaze was not immediately released. More than 200 firefighters battled the leaping flames. Elsewhere in New York City, emergency backup power failed and 10 feet of water flooded the basement of NYU Langone Medical Center, prompting the evacuation of 260 patients.Nurses carried sick newborn babies down nine flights of stairs, manually pumping air into the lungs of those on respirators. Atlantic City, New Jersey, became an extension of the Atlantic Ocean. Seaweed and ocean debris swirled in the knee-deep water covering downtown streets. Floodwaters ripped up part of the city's fabled boardwalk. Like many New Jersey residents, Montgomery Dahm stared in awe at the water that deluged Atlantic City. Authorities scrambled in boats to rescue trapped residents in several towns after a berm broke in Moonachie, New Jersey. "Within 30 minutes, those towns were under 4 or 5 feet of water," said Jeanne Baratta, chief of staff for the Bergen County executive. Hundreds of people had been rescued Tuesday morning, New Jersey Gov. Chris Christie said. "We'll have to rescue hundreds more," he said.